The beloved Nashville pizzeria, Sicilian Pizza &amp; Pasta, has been forced out of its location on Church Street after its building was bought by developers. NASHVILLE, Tenn. (WTVF) — The beloved Nashville pizzeria, Sicilian Pizza & Pasta, has been forced out of its location on Church Street after its building was bought by developers. The shop has been at their 9th Avenue and Church Street location for 15 years. It's become one of the most well-known pizzerias in Nashville, because it's open until 4 a.m., and has been satisfying the late night munchies for years. Developers bought the building on Church Street for the massive Nashville Yards project. The development will be home to Amazon, an MGM resort, and a Grand Hyatt hotel. Even though Sicilian owners fought to stay as long as they could, the restaurant was forced out. They're currently operating out of Michaelangelo's on 22nd Avenue North in the Elliston Place area so they can still deliver pizzas. The owners said since the move, business has gone down 30% and people keep going to the old location on Church St.
Caroline Koerner and her family stopped by to watch the underground blasting at the Nashville Yards while on their vacation. Koerner said, "Everyone we've spoken to has said 'Ooo yes, in Nashville you'll see lots of cranes, lots of construction, and crazy drivers.'" The lone pizzeria surrounded by a gaping hole stood out to them too. Koerner said, "It looks kinda sad." 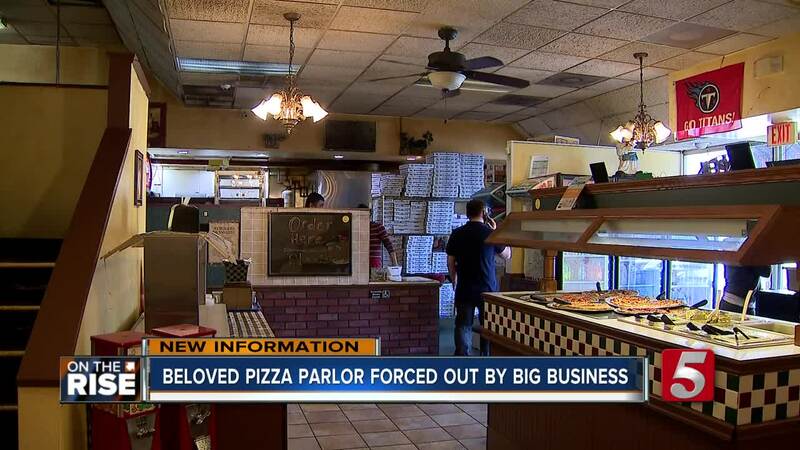 Last week the Sicilian Pizza place had to move out since their landlord sold the property. Doniyar "Donny" Abbimanapov said, "Sad. Really sad. It hurts." They were the lone ranger, holding out, and fighting to stay on Church Street as a billion dollar development went up around them. Donny said, "We operate kind of a family business. They've been here for too long. We can't just give up." For now, they hope their struggles will be short lived. Donny said, "We hope that the customers will be back." Fortunately, they've secured a new location at 327 Union Street, and they're currently renovating it which has proven costly. Donny said, "We had to do what we had to do." The owners said they would love to move back if Amazon wants them to cook pizza in their cafeteria. Their plan is to move in a month to the Union Street spot by Hotel Indigo. They can still be called at 615-770-7077 and their menu is here.